The Panasonic WORKiO DP-2310 industrial grade multi-function copier is designed to make printing, copying, scanning and faxing operations easy and convenient while providing reliability and solid workhorse performance. Targeted to large and medium businesses, this model can fulfill a wide range of daily requirements without putting a strain on a company's budget. Respectable document processing times and decent paper handling capacities are combined into this versatile package. This machine can be ordered in any number of custom configurations and can be expanded to meet increased needs and demands. At print and copy speeds of 23 pages per minute, the Panasonic DP-2310 offers average performance that can easily meet the demands of small and medium businesses. A first page time of 4.5 seconds is just slightly higher than the average print speed of 2.7 seconds, making print jobs of 2 or 3 pages quick and convenient. 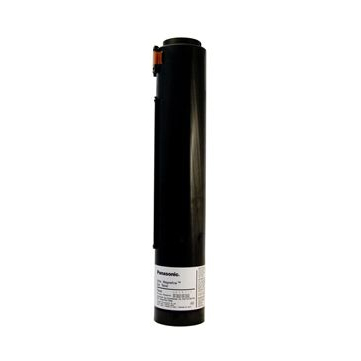 The dry dual components in the print mechanism ensure reliability of use and reduced maintenance time and expense, helping to reduce paper jams and delays. A 35 second warm up time is approximately three times less than most comparable models that are typically rated at about 99 seconds. Copy resolution is a maximum of 600 dots per inch, providing reasonable quality text document reproductions and variable zoom functions range from 25 to 400% in 1% increments. Copy ratios provide for document enlargements of up to 200% and reductions down to 50% of the original document. Multiple copy quantities are selectable up to a maximum of 999, with an automatic reset to 1 upon completion or cancellation of a job. 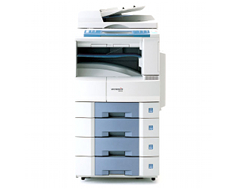 An automatic document feeder can accommodate up to 50 sheets of paper to be scanned, copied or faxed. A page memory capacity of 32 MB ensures quality document reproduction, whether the page includes all text, text and graphics combined, or all graphics. A standard 16 MB of sort memory can be upgraded to as much as 12 GB with addition of an optional hard disk drive. The standard printer interface options that are installed are a USB1.1 local port and an Ethernet 10BaseT/100Base-TX adapter. The Panasonic DP-2310 is compatible with operating systems as recent as Windows XP and Mac OS X support is also included. An optional fax module comes with a 33.6 Kbps fax modem with four types of compression and an average transmission speed of 3 seconds per page. Scan widths of up to 11.5 inches are possible. A base memory of 4 MB for temporary storage of up to 240 fax pages comes standard and can be upgraded to 8 MB for storage of up to 480 pages. Optional fax to email and internet fax options are also available and support TCP/IP, SMTP, POP3 and MIME protocols for an number of applications and can automatically encode faxed documents to TIFF or PDF formats. An extra-large touch screen interface and extremely user-friendly controls make this model easy and convenient to use for people with varying eyesight restrictions and levels of technical aptitude. Print speeds are considered relatively slow for comparable, industrial grade models, as much as one third of maximum print and copy speeds possible with other machines. Copy resolutions are low as well, about half of other models in its class. Maximum possible resolution, combined with 256 grades of grayscale rendering, can often cause copied graphics to appear grainy and pixelated. Most other manufacturers include a G3 fax module as standard with machines in this class, so having to purchase a fax module as an upgrade for this model can be considered an unnecessary inconvenience. A combination of network integration capabilities and features makes this model moderately difficult to configure as a shared resource within an office network. Intermediate knowledge of network and server protocols is necessary for successful setup. Review it: "Panasonic DP-2310 "
Replacement toner can be purchased, in black only, with a maximum yield of 15,000 pages. 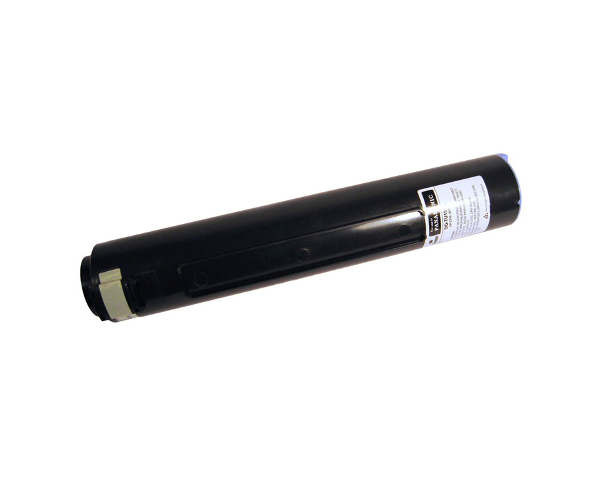 At standard toner prices, toner cost per page is less than one cent, making it extremely affordable for any size business to satisfy their printing, copying and faxing needs.